I'm about as independent as they come. I've lived alone since after college and moved from College Station, Texas to Chicago, to Washington D.C., to Tyler, Texas to Sarasota, Florida without knowing a single soul in most of those places. I was not all scared but rather excited about new places and experiences. I've gotten so used to doing everything for myself that I can't think of much I need someone else to do for me. Well, I'm not exactly skilled at major home repairs, BUT I have been spending an increasing amount of time at Home Depot and have an incredibly skilled handyman. So when it comes to getting married in a few months, what scares me most (and scares is really too strong of a word) involves losing a little of my independence, not committing to one person for the rest of my life. That doesn't scare me in the least; I'm as committed as I am independent. Much like deciding on my career at age 5 and never wavering, once I knew Max was the one, and I knew pretty quickly, I've never had any doubts. Now, moving in together and changing my last name, those are the hard parts for me. Although I'm a card-carrying member of the Beyonce "Who run the world? Girls!" Club, I'm also pretty traditional, so I never considered not legally changing my name. It especially makes sense once you have children so that everyone in the family shares the same name. But that doesn't make it any easier. It's not that I just love my last name. It's not particularly poetic and no one can spell or pronounce it correctly. It's just that it's part of me, and suddenly becoming someone else one day is hard to swallow. I read this article and could totally relate to the author's story. (By the way, I recommend you read it. It's written by a seemingly sane, intelligent woman with logical points.) She mentioned how she almost broke off her engagement because of a fight over changing her last name. While I could never imagine that, I did recall a little tiff I had with my fiance regarding that very subject. 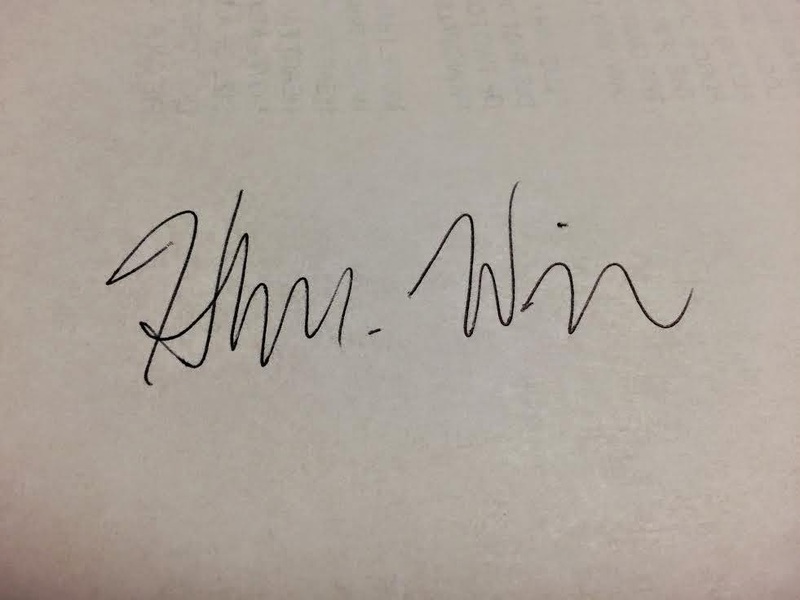 I was signing a receipt, and he asked me if I had practiced my Winitz signature. I said, "no, and after we get married, I plan to sign my name the exact same way I always have." As you can see from the photo, my signature doesn't look anymore like Wielgus than it does Winitz. And as we were having this discussion, I was sitting there thinking: look, I'm already changing my name, now I have to change my second-nature, scribble of a signature, too? I think it's hard for the person not changing their name, and in some ways their identity, to relate to the person who is going through that process. Especially for those of us who are a little bit older getting married, we've lived many adult years with our names and giving it up at the drop of a hat isn't easy. As the wedding gets closer, I've started to think about ALL of the things that bear my last name. For example, when I signed onto my computer to write this blog post, even the welcome screen says "Hayley Wielgus." Do I have to change that? Do I wait until I get a new computer? How does all of this work? Not only is it a little psychologically difficult, this is a time-consuming task! Now...softening the blow is the fact that I'm keeping my maiden name professionally. I know I'm not a famous network reporter, but the television news world is small and now that I've started to establish myself as Hayley Wielgus, I think it's best to maintain my "brand." Plus, having a future husband who also works in TV, I think it's best for us to have different on-air last names, since we're not exactly trying to market ourselves as a package deal. I know I'm not completely alone in my apprehensions about changing my name, because several women have shared with me how difficult it was for them. But it can be hard to express those thoughts, especially with our future spouses, because, well, men can be a little sensitive about these things. (Sorry, guys!) I think, for some, it challenges their masculinity. Hate to break it to some in the male population, but not all women are sitting around writing Mrs. Whoever in bubbly cursive and dotting the Is with hearts, like we did in seventh grade. Instead some of us are mourning the loss of Ms. Maiden Name. Our future spouses may mistakenly think it's a reflection of our feelings about marriage or about joining together as a family. I can't speak for anyone else, but for me, that couldn't be further from the truth. I'm beyond excited to marry Max and to start our own little family. I just know introducing myself as Hayley Winitz is going to take a little practice, so bear with me!